The Alto Douro Wine Region is a cultural landscape shaped by winemaking. The region has a hot dry micro climate and rocky soil. This results in ideal growing conditions for grapes. There is archaeological evidence for winemaking in the region dating from the 3rd and 4th centuries AD. The region has Portugal's highest wine classification as a Denominação de Origem Controlada (DOC). While the region is associated primarily with Port wine production, the Douro produces just as much table wine (non-fortified wines) as it does fortified wine. The landscape consists of terraced vineyards on large and small estates, white-walled villages, olive and almond crops, the river Douro. In 2002 I had planned to visit the nearby Coa Valley and had already arranged a tour when they informed me that a visit had become impossible because of flooding. So I limited my tour to the North-East of Portugal to the Douro Valley. There's a nauseating road that follows the Douro River. The towns there looked really rundown. And because it was winter there was not much to see of the wine too. On my second attempt for the Coa Valley (this time succesful), I once again passed the Douro Valley. The areas of these 2 WHS are nearly contiguous. This time I did not take the winding road along the Douro, but the main highway. 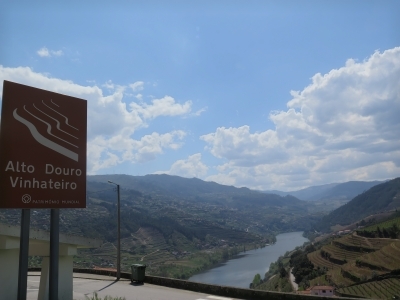 Numerous signs point to the Douro vineyard landscape. The landscape is very pretty at times. But it's a pity that you can only speed by. There are hardly any parking spots or lookouts along the way. Another wine valley...but wine valleys are beautiful! I will not get into the "unique" or whatnot aspect because it has already been touched by other reviews. I personally enjoyed driving through the section of Peso de Régua to Pinhão and back, stopping for pictures along the way and buying a bottle of wine from one of the many vineyards. I am no wine expert to know which is a good year or which of the vineyards are supposed to be one of the better ones and having to drive I obviously did not do a wine tasting. All I will say is that the wine was well received as a gift. Vineyards are not the most popular type of WHS among the community of this website. One reason is certainly that they belong to an over-represented category. Our vineyards connection comprises a total of 32 WHS, almost half of which are devoted exclusively or predominantly to viniculture. On the other hand, viniculture is one of the oldest and most traditional agricultural technique. 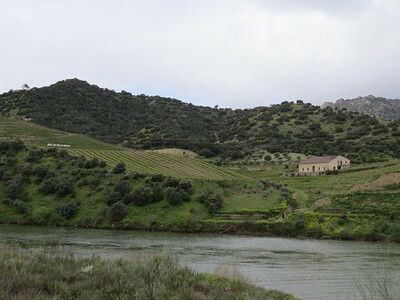 And vineyards are often picturesque landscapes, especially if they are along a winding river. And these qualities are given in the Douro Valley. 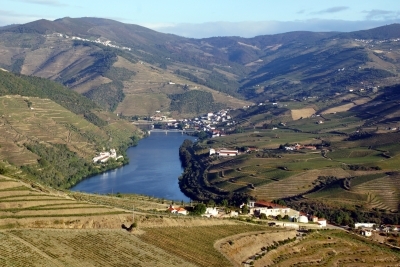 Alto Douro is the oldest demarcated wine region in the world with a protected designation of origin. The core zone of the WHS covers an area of about 24,000 hectares, a stretch of 80 kilometres along the Douro river from Peso da Régua to the Spanish border with branches to include also the mouths of the tributaries Corgo and Rio Pinhão. Coming from Guimarães on the N101/N108 I first saw the Douro River in the small village of Rede. This is also the western end of the core zone. A few kilometres further on is Peso da Régua, one of the main towns on the Douro. It is not a particularly pretty town and is not within the core zone, but the Museo Douro is worth a visit. The exhibition is well done and you will learn everything you need to know about this WHS: the history of the area, the nature and geology and the peculiarities of viniculture here, the rock art of the Coa Valley is also explained. Finally, you can taste a port wine on the terrace overlooking the Douro, the tasting is included in the entrance fee. I arrived in Pinhão just in time for my boat trip, which I had booked online a few days earlier. In Pinhão, several companies offer boat tours. I booked a two-hour Rabelo tour with Magnífico Douro upriver to the mouth of the Tua. There is no main road along the river in this section, just the streets connecting the Quintas. It was very relaxing to enjoy the river and the vineyards from the boat, an audioguide gave some explanations and on the way back I had my second Port tasting that day - but not my last one. Back in Pinhão I went to the Quinta do Bomfim, owned by the Symington family, one of the leading producers of premium (vintage) port wine, for my third and most comprehensive tasting. I can recommend the Quinta do Bomfim, not only because of the beautiful location. I was pleasantly surprised by the taste and the variety of port wine. It is also possible to visit the cellars, but the tour was fully booked that day (my visit was in May 2018). But I didn’t mind, I already had visited a port wine cellar at Vila Nova de Gaia, where I learned about the distinctive features of port wine and its production. Port is a fortified wine, which means that high-percentage alcohol is added to kill off the yeast after one or two days of fermantation. As a result, a part of the sugar is kept, the wine is sweeter and has a higher alcohol content. Due to the extreme climate, cold in winter and very hot in summer with temperatures up to 45°C, the wine is stored only one winter in the cellars of the Quintas. 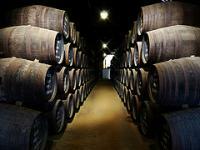 In the spring, the barrels are transported to Oporto; formely on the Douro, today by truck. I stayed overnight in Pinhão. The next morning, I continued my journey towards the Coã Valley. From Pinhão, the N222 runs uphill and leaves the core zone of the WHS. 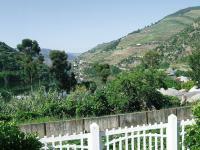 At the first one or two kilometres are some spots with a beautiful view of Pinhão and the surrounding vineyards (photo). A few kilometers further on, at São João de Pesquiera, I made a detour via the N222-3 to the Vale de Figueira, where the road again touches the core zone. The road is very winding, it took me almost an hour for 25 kilometres, but also because I often stopped to admire the landscape. Here the valley is narrower and the slopes are steeper. The eastern part of the Alto Douro is calm and secluded, at least it seemed so early in the morning. All in all, I really enjoyed my visit to the Alto Douro, it's one of the best wine regions on the WH list I have visited so far. And although I still prefer non-fortified and dry wines, I think that from time to time I will go for a Port, now that I know how a good Port has to taste. It’s not always easy to convice my wife we need to go to yet another world heritage site but I had no problems when I announced Alto Douro to her. We both love the Porto wines they produce overthere and even she thougt a day of tasting and drinking is not something you skip while being in the area. The prettiest part of the site lies between the small towns of Pinhao and Peso da Regua, an area full of quinta’s ( the name the Potugese gave their winehouses) and known tot he locals as Cima Corgo. The town of Pinhao itself is not that special but it has some nice views over the river and surrounding hills full of vines. 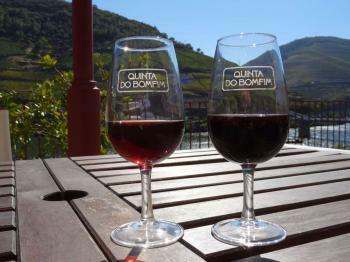 I your there don’t forget to visit Quinta de Bomfim and it’s exquisit selection of fine wine’s. Among others they produce widely known Ports like Dow’s and Graham’s. We spent a while on their nice terrace overlooking the whs and had a great sunny afternoon. It even got my girl to tell me that we had finally visited a truely great Unesco monument. And that says a lot. Cheers! I visited this WHS in August 2014. The first glimpse and enriching experience was by car after having visited the Coa Valley. There were street signs indicating the area inscribed as a WHS and several winding roads that lead to the terraced vineyards. Plenty of grapes on the vines when I visited. Then I enjoyed the captivating views of the Alto Douro valley from the Douro itself on board a boat tour I booked from Oporto. This is definitely a more relaxing experience but I must say that visiting by car on the whole was my favourite experience of the two. To wrap up I decided to visit Graham's cellars at Vila Nova de Gaia to taste the Alto Douro produce and learn about the history of Port-making. Bliss! I found the most relaxing way of visiting the Alto Douro was to take the train from Porto to Pocinho and back. The train runs up the valley with excellent views of the rocky gorges, the vinyards and wineries. Portugal is a small country but its landscape changes a lot going from north to the south, changing from green to yellow during the summer. This is due to the large number of rivers in the northern region when compared with the southern one and also due to the amount of water that flows in these rivers. Douro river comes from Spain and since it touches Portugal, in a region that it is the frontier between Spain and Portugal (International Douro park), it passes along the most impressive scenery that I know for a river. However, its rapids disappear due to several dams. Fortunately, most of them permit that boats pass through. The deep valleys are amazing. When the park finishes, two Unesco's World Heritage sites appear. These are the Rockart sites of the Coa valley (an affluent of Douro river) and the Douro Wine Region. These two sites may be visited from (O)Porto, 2nd largest city in Portugal, taking a train or a boat (cruise). Douro Wine Region is the oldest marked wine region and it is the mother region of Port and Douro wines. 183 Community Members have visited.